Zifeng Wu, Chunhua Shen, Anton van den Hegnel attended the competition of Nuclei images segmentation task and won the first place! Grading and diagnosis of tumors in cancer patients have traditionally been done by examination of tissue specimens under a powerful microscope by expert pathologists. While this process continues to be widely applied in clinical settings, it is not scalable to translational and clinical research studies involving hundreds or thousands of tissue specimens. State-of-the-art digitizing microscopy instruments are capable of capturing high-resolution images of whole slide tissue specimens rapidly. Computer aided segmentation and classification has the potential to improve the tumor diagnosis and grading process as well as to enable quantitative studies of the mechanisms underlying disease onset and progression. The objective of this challenge is to evaluate and compare segmentation algorithms and to encourage the biomedical imaging community to design and implement more accurate and efficient algorithms. 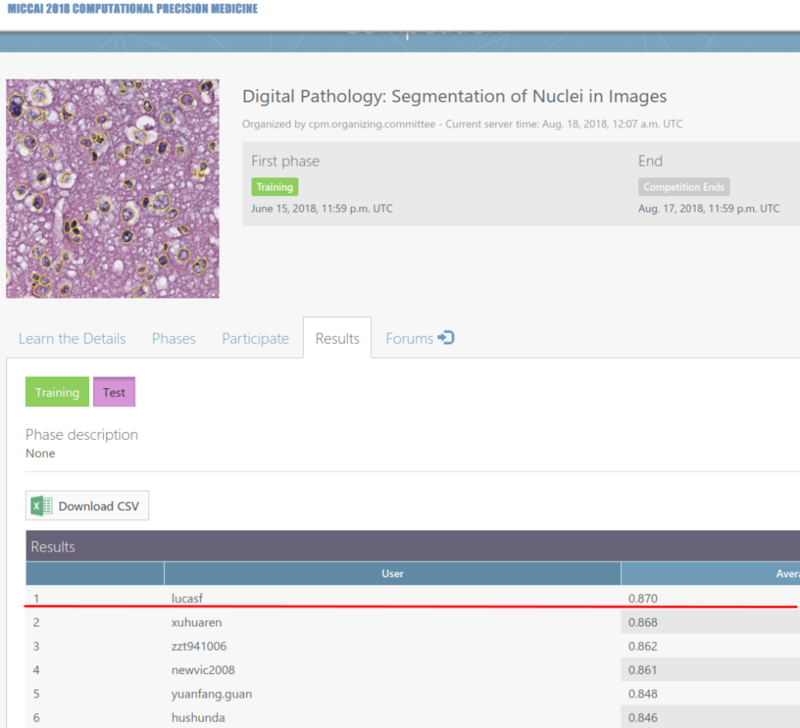 The challenge will evaluate the performance of algorithms for detection and segmentation of nuclei in a tissue image. Participants are asked to detect and segment all the nuclear material in a given set of image tiles extracted from whole slide tissue images. This challenge uses image tiles from whole slide tissue images to reduce computational and memory requirements. The image tiles are rectangular regions extracted from a set of Glioblastoma and Lower Grade Glioma whole slide tissue images. Nuclei in each image tile in the training set have been manually segmented. Note that the tiles are not of the same size.